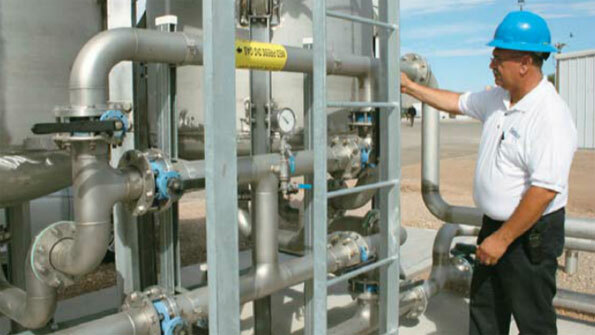 In El Paso, Texas, biogas is helping power wastewater plants. Gas emitted during the treatment of wastewater at three El Paso (Texas) Water Utilities (EPWU) plants is now being turned into energy to help run the facilities themselves. By monitoring industry best practices, EPWU energy management coordinator Manuel Perez learned about the benefits of using digester gas to co-generate electricity and thus reduce the plant’s carbon footprint. He then set to work assessing the feasibility of such a project. Traditional methods of wastewater treatment call for solids to be removed and broken down, producing a mixture of methane, carbon dioxide and other materials collectively called biogas. As part of the recently completed project, EPWU now captures the biogas, pumps it into a chamber full of iron-covered wood chips where hydrogen sulfide is removed. The gas is then pumped through carbon filters before ultimately being used to run electric generators that help power the plants. “It saves us 25 percent of our overall energy bill,” says John E. Balliew, vice president of operations for EPWU. “For a single plant, the total amount of energy is about a million dollars a year, so it’s a significant amount of money.” Each year the technology will save enough energy to power 2,000 homes and reduce the utility’s electric bill by $689,000. The new technology not only will save on EPWU’s electricity costs, but it also provides a reliable backup electric power supply for the plants. Previously, the gas was flared off, providing no beneficial use. The equipment has been installed at the Roberto R. Bustamante Wastewater Treatment Plant in the city’s Mission Valley, the Haskell R. Street Wastewater Treatment Plant in South Central El Paso, and the Fred Hervey Water Reclamation Plant in Northeast El Paso. The $8.2 million project was funded in part by $4.1 million from the American Recovery and Reinvestment Act and administered by the State Energy Conservation Office. The remaining amount of funds was provided by the El Paso Water utility.